One of the actual downsides of Pro Tools for Windows (yeah, yeah, insert sarcastic remarks here!) 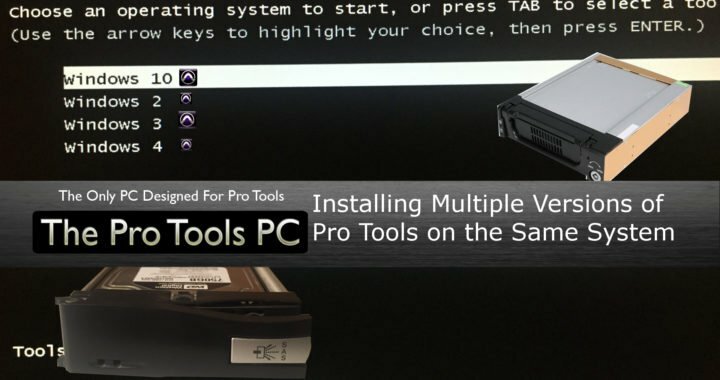 is the ability to have multiple versions of Pro Tools on the same system. This is thinking beyond having just Pro Tools 10 and 12 on the same system, But having different versions of 12 or 11 as examples. The way I have always dealt with this, is by having multiple partitions on the same hard drive. To take this a step further, I always keep my C: drive in a removable hard drive caddy. This allows me to just pop out my operating system drive and replace it with another. I use this method to keep my operating systems separate. I keep Windows 7, Windows 8-8.1, and Windows 10 all on their own hard drive. Then on each of these drives, I have 4 partitions with that operating system that I can use for different purposes, or multiple Pro Tools builds. The old saying “there are multiple ways to skin a cat” applies here. Some will say they like to install Windows 7 and 10 on the same drive for instance or keep different hard drives with different Os’s all mounted and select the OS from any of them they want to use or any number of different scenario’s. My argument is to keep everything as fool proof as possible by eliminating as many points of failure and problems as possible. I have a lot of experience recovering hard drives, rebuilding Master Boot Records, and other geeky tasks, BUT that does not mean I want to put myself in that situation if I do not need to, nor do I enjoy trying to talk someone through it! I say this as a point of caution. My recommendation for the faint of heart is to use a new hard drive to move forward. Keep your existing drive operable. Do not put yourself in a situation where if you make a mistake, your entire rig will go down and be down until you come up with a resolve. The first idea that can help make this a smooth transition is to use a removeable hard drive bay for your computer. There is lots of options and variables here, including budget, computer case style, space constraints, system connections, drive size (3.5” or “2.5”) among others. Of course, there are lots of options for USB3, Thunderbolt, ESata, etc. My preference is to keep the OS on the Sata interface, so I will be focusing on that for now. My preference, are removable bays that fit into a 5.25” drive bay. I also prefer the models that require trays. I prefer the trays because I know my hard drive is protected. The trayless versions are cheaper, but then I worry about hard drives sitting on a shelf or on top of the computer unprotected. The drive housing will mount identical to a CD/DVD drive. They will typically come with 1 drive caddy, then you can purchase all the caddies you need from there. You can also typically use 2.5” drives in any of these caddies with a 3.5” to 2.5” adapter. 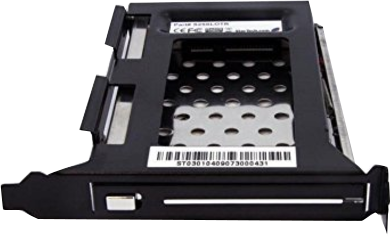 You could also find them specifically for just 2.5” drives. 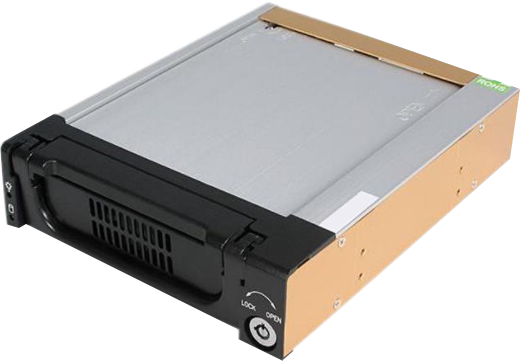 They also make kits that allow you up to 4-2.5” removable hard drives in a single 5.25” slot! For tighter spaces, they also make a cool unit for the rear PCIe slot space in a case. These will allow you to fit a 2.5” drive in an empty PCIe slot on the case. You can then pop the 2.5” drives in and out at will. These will connect through the regular Sata interface. The housing just fit in the slot, they do not actually “insert” into the PCIe slot of the motherboard. To be truthful, I have also just left a Sata and power cable easily accessible in the front of my case and just plug and un plug hard drives right there. It is an option, though not the best, nor would I recommend it. In the simplest form, You could have just 1 OS installed on each hard drive with the version of Pro Tools 10+11 or 12 that you want. You could then just pop the drive in and out that you want. Of course that is limiting the maximum capabilities of this setup. So next time we will discuss having 3-4 operating systems accessible at any time from a single hard drive. Posted in System Maintenance, Tutorials and tagged Hard Drives, Partition, support, Tips, Tutorial, Windows, Windows 10. ← Free Galaxy Drums License with Purchase!